The North Philadelphia mother and restaurateur known for throwing lavish prom send off parties has pled guilty to federal fraud charges including multiple counts of wire fraud and acceptance of government benefits. 44-year-old Saudia Shuler applied for Social Security disability in 2014 after having cancer and suffering a stroke. She then continued to accept disability payments and failed to notify the government when she was able to return to work and began to make an income. Shuler was paid $37,000 in benefits. She is known for throwing over-the-top parties with hefty price tags. A Dubai-themed prom party in 2017 for her son complete with exotic cars and a live camel cost $25,000. 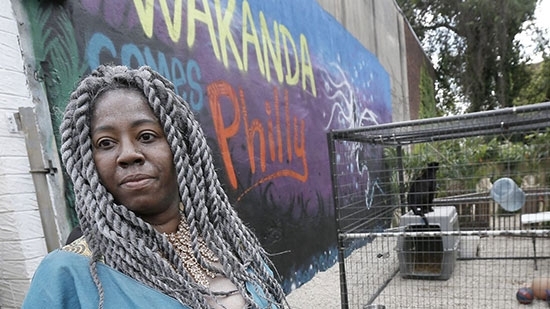 Last spring, she threw Wakanda themed parties for contest winners with a live cast of characters and a panther. Those also costs $1,000s. Shuler owns the Country Cookin' takeout restaurant and holds a big Christmas party in the community with gifts for kids. Shuler also runs book bag giveaways. Sentencing will be in May. Police in Chester County are offering a $5,000 reward for information that leads to the arrest and conviction of the person who slashed over 100 tires early on New Year's Day in Tredyffrin Township. A individual wearing dark clothing was caught on one person's security video that morning. The vandal moved quickly through the neighborhood and punctured tires on around 50 cars. Many vehicles were hit multiple times. The damage was spread over 5 streets. If you have any information, or may have video yourself, contact Tredyffrin police. The New Jersey law that bans smoking on public beaches and parks has now gone into effect. New Jersey Governor Phil Murphy signed the bill back in July 2018. Fines for a first time offense are $250 and go up to $1,000 for a third offense. The bill doesn't specify who would actually enforce the law whether it would be lifeguards, police, badge checkers, or someone else, but Murphy doesn't think it should be the lifeguards. "A lifeguard is there to save lives, first and foremost, for people in the water" Murphy said. "I don't want to add an extra burden to the lifeguard and take him or her away from their primary mission." Designated smoking areas of 15% of the beach can be set up according to the bill and smokers can always use the parking lot. Vaping is also included in the ban. Individual towns have discretion on how to set up and enforce the bill.